Another month of vegan eats! If it all seems really random, it's because it is- there's no theme here, these are just the delicious random things I've eaten throughout the month of March. Maybe like you, I've been craving some more cohesiveness and structure- that's why I'm starting to cook from ONE cookbook per month (April's is Vegan 101), and I will be reviewing one fitness studio per month! I hope you will enjoy those blog posts. For now, I don't know a better way to organize all my foodie adventures besides grouping them into a month, so I hope you enjoy these March eats, Part I! I love Veggie Grill, and I already eat there all the time! So when they invited me to try their new collaboration with Beyond Meat, I knew it was going to be really good. And girl, it did not disappoint! I visited the Hollywood location, and enjoyed the Beyond Meat bratwurst on a pretzilla bun (I'm already sold! ), Sierra Nevada cheese sauce (OMG BEER CHEESE SAUCE! ), caramelized onions (AAAHHH!!! ), mustard, pickled red cabbage, and crispy fries. OMGGGGGG this was amazing!!! Vegan or not, anyone will love this! I love how Veggie Grill and Beyond Meat are normalizing vegan food, because I remember when a lot of vegan food looked like brown mush! How beautiful is this, with the presentation and everything? Just learn from my mistakes, because I ate the pickled red cabbage as a side- you need to put it on the brat! What a great and instagrammable idea- a coffee shop that also sells lots of plants! This makes the decor especially fresh and beautiful, and the white decor plus green houseplants is a huge trend these days! I loved spending some time here, and the icing on the cake was this totally gangsta BEAR in my coffee! I am so into exploring coffee shops lately, and this was is a total gem! It's two stories, too! Coffee shops are such a blank canvas for the owners' creativity, and I'm loving the vibes here! Oh, here's just an example to show you that you can eat vegan anywhere!!! I took a job at a "marketing company," it turned out to be door-to-door sales!!! Turns out, I'm not so great at that, and it's HARD, so I'm looking for personal chef work now! 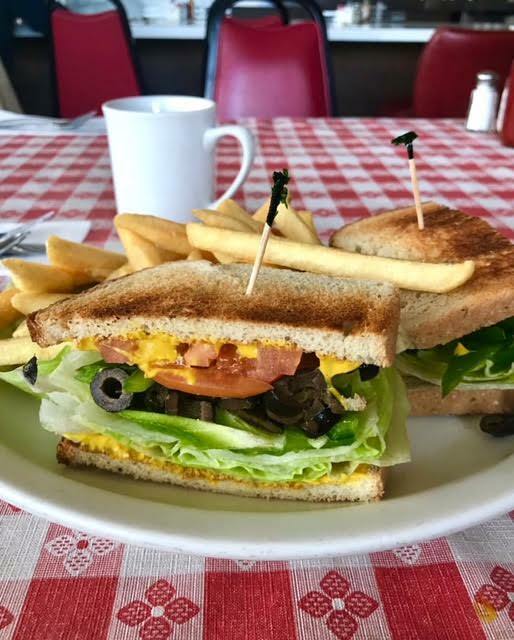 Our sales work was in a not so great area of Santa Ana, and I stopped into this cute diner and they made a veggie sandwich for me! Turns out bread, mustard, and any veggies are all you need to make a delicious sandwich! Never would have thought to put olives like this on a sandwich, but hey! Why not? It's like pre-tapenade! Also, I just love those picnic tablecloths! That's it for my March Food Roundup Part I, I hope you enjoyed reading this! Where have you been exploring lately? Any cute coffee shops I should know about? Let me know in the comments!